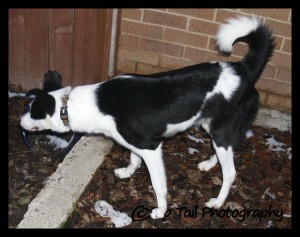 Charlie is a Border Collie! This is Charlie! She came upon us pretty quickly. She’s a foster and we only probably will have her until Friday morning. In rescue, things happen super fast. Unlike buying a puppy! 🙂 Which can take a long time! Charlie was at the Draper shelter (a shelter I didn’t even know existed!). I got an email a few days ago from a shelter person there, saying Charlie was a great collie, and could really needed to be rescued. 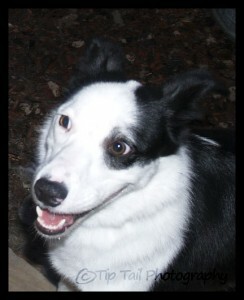 Well, I do Lassie type collie rescue, not usually border collie. Unfortunately there are a zillion border collies in rescue, which is super sad. Mainly because people want a smart high energy dog… but, they don’t know exactly what that means. If a border collie doesn’t have a job, or something to do, she will give herself something to do and that’s usually chewing or digging or something destructive. So much of the time the border collie ends up in the shelter. 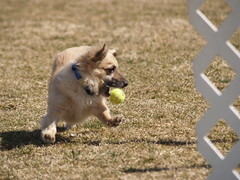 Of course it’s hard to get pictures of a new foster dog, and Charlie is no exception. She is a bit wiggly and excited and doesn’t want to sit still. She was at the shelter for three months! That’s a long time. I guess she didn’t show well. She was shy and afraid and probably depressed. But it’s a shame she was shy and afraid.. because in our house she has already blossomed and we’ve only had her for four hours! She hasn’t barked yet, so she may not make a good burglar alarm. But the rest of our dogs take care of that. I love her markings. She has a great pretty face. She is very happy and snugly. When I lay on the couch to watch TV, she is laying right next to me, pressing against me, her head on my leg as she relaxes. She loves the contact. She probably has a lot of energy, and is very smart. She’s young, about a year old. Her teeth are a bit grimy but probably not bad enough to have cleaned. And the wonderful lady at the shelter even gave her a bath, so she’s soft and she smells great! Author CynthiaPosted on 12 February, 2009 22 August, 2012 Categories RescueTags Border Collie, Rescue4 Comments on Charlie is a Border Collie! So, I want to get back into jogging. 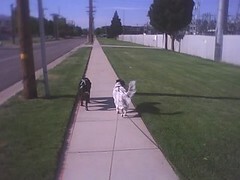 I wish I could take three or four dogs jogging, but when leashed on the streets I can only take two. This morning I took Chase and Muffit jogging and they loved it. Chase knows my jogging shoes and gets excited when I get them out. Muffit doesn’t know them… yet, but I’m sure he will soon. I don’t think Muffit has been this tired since we went camping! He is fairly high energy, and he does need more exercise. I’m realizing I can train three dogs… two is better, though. But four is really taxing my time and Muffit is not getting as much training as he needs. 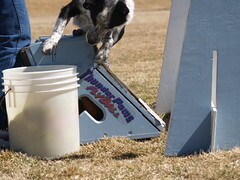 Well, I guess he may not be one of my big competition dogs, I still want to train him up for flyball, though. He is starting to get it in the back yard… the box, and he likes it! So this picture was from my new cell camera phone. It’s not that great quality, but it’s nice being able to take a really small camera with me everywhere, and a phone too! And this is Keno, she’s the dachshund on the team. Though she may have something else mixed in there. She’s a doll and loves to play with her tennis balls! And here is the back end of Apache. 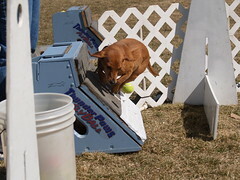 It’s hard to get the timing just right with these flyball pictures. So this is my slow timing. However, I thought it was a very cute picture anyway, with her back legs as they just pushed off the box. I adore Apache. She’s deaf, and she’s a cattledog, and she is so smart. And has the most gorgeous box turn! 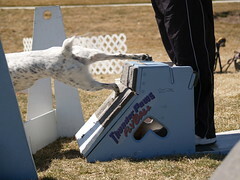 Our team, Thunder Paws, is an awesome team and I’m glad I found them! 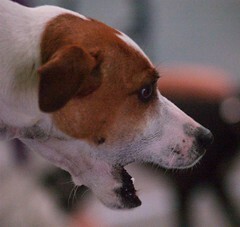 Here’s a crowd of dogs at flyball practice… you can see Chase and Tatum in the background in their x-pen. And Muffit in his crate. I had him in the pen but… silly boy jumped out, he was too excited. So he got the crate (did I mention I got that crate for free? Driving by a house it was set up in the yard with a be FREE sign on it. Score! Perfect size, double door foldable wire crate. Destiny…).